Ray Dorset is Mr Boogie; a one man rhythm machine who has been rockin’ and rollin’ for over 40 years. 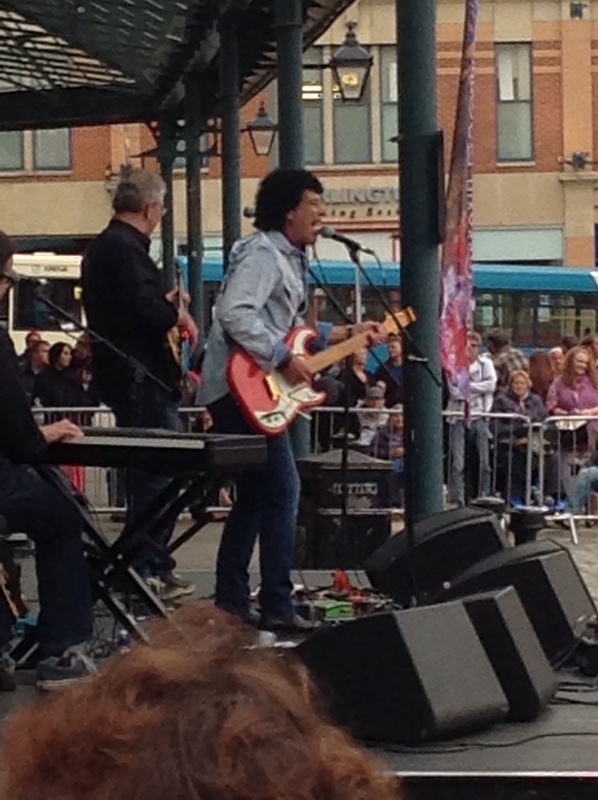 Yesterday he brought his brand of rhythm ‘n’ blues to Darlington, where his band Mungo Jerry headlined the Darlington Rhythm ‘n’ Blues Festival. 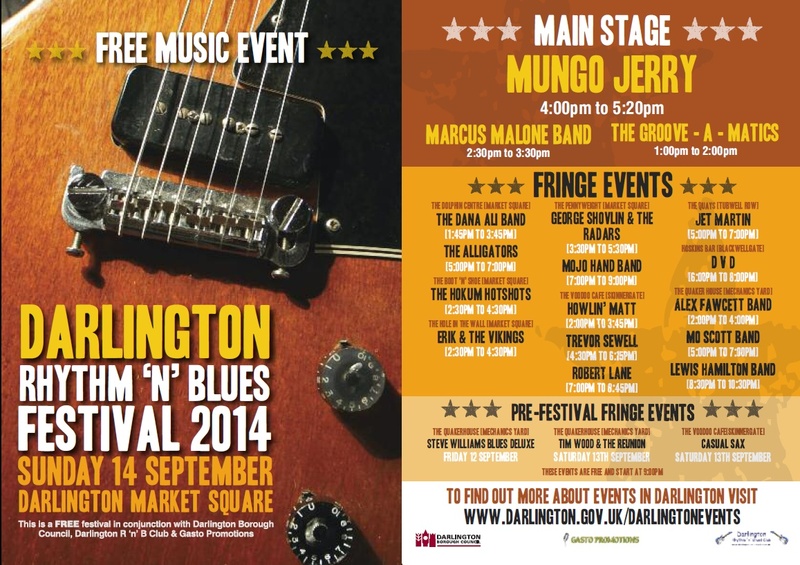 The annual Darlo event takes place in venues across the town, with a main stage in the market square. Previous headliners have included The Pretty Things and Andy Fairweather-Low. The music runs from 1pm until 11pm and is organised in by Darlington Borough Council, Darlington Rhythm n Blues Club and Gasto Promotions. I arrived in time to catch the Marcus Malone band who were playing some fine blues rock, and warmed the crowd up for the main event. The square was packed; everyone was in good spirits and enjoying the music on a chilly, but dry Sunday afternoon. Just after 5 o’clock Ray Dorset walked on stage, strapped on his guitar, stamped his foot, and showed us all how he can still command a big crowd at an open air show, 44 years after he stole the show at the Hollywood music festival. It’s 42 years since I saw Mungo Jerry rock the Friday night of the Reading festival, and I was looking forward to reliving some of the memories of that event and of Mungo gigs in the mid 70s at Sunderland Locarno. Today Mungo Jerry is Ray Dorset (of course, and as it always has been) on guitar, mouth harp and vocals, Jon Playle (bass), Mark David (drums) and Toby Hounsham (keyboards). The set was a mix of blues, Mungo Jerry hits, and “Feels like I’m in love”, which was written by Ray Dorset and a big hit for Kelly Marie in 1980 (I’d forgotten that he’d written that one).They went down well with the audience in the market square; Ray was as energetic and funny as ever, getting the crowd to join in and sing along, which everyone did, particularly during “In the Summertime”. Great stuff. A good show from a real trouper, and it was great to see that him still rocking. Setlist: Rock Me Baby, Rolling and Tumbling, Long Legged Woman Dressed in Black, You Don’t Have to be in the Army to Fight in the War, Lady Rose, The blues has got you?, Open up, Feels like I’m in love, In the Summertime. For a short period in the early 70s, it must have been sometime between 1972 and 1974, I swear I saw Mungo Jerry almost every month. Now I know that will be an exaggeration, and my memory is probably playing tricks on me again, but I do remember seeing Ray Dorset and his band several times at Sunderland Locarno, and possibly once or twice at Newcastle Mayfair. 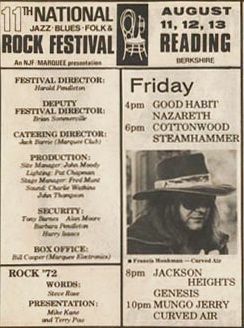 I also saw them on the Friday night bill at the Reading Festival, on August bank holiday weekend in 1972, sandwiched between Genesis and headliners Curved Air. By the time I got to see Mungo Jerry the jug band of “In the Summertime” fame had morphed into a straight ahead boogie band. Gone was the washboard and the double bass, to be replaced by electric guitars and rock’n’roll. The line-up of Mungo Jerry seemed to change a lot, the only constant being front man and band leader Ray Dorset. 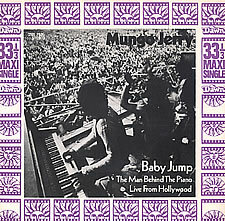 Mungo Jerry had a lot of hits “back in the day” including the excellent “Baby Jump” which, along with “In the Summertime”, reached No. 1 in the UK singles chart. “Lady Rose” was another great song, followed by “You Don’t Have to Be in the Army to Fight in the War”, and “Alright, Alright, Alright”. “In the Summertime” was an absolutely massive smash, reaching No. 1 on the singles charts in the UK, the US, Canada, Ireland, Australia, Austria, Belgium, France, Germany, Italy, The Netherlands, Norway, Switzerland and South Africa. Wow! The song has sold over 30 million copies, making it one of the highest selling singles of all time. Mungo Jerry last hit the top twenty with “Long Legged Woman Dressed in Black” in 1974. You could go along to a Mungo Jerry gig and be sure that you were going to hear some high energy rock’n’roll, and sing along to all those hits. Ray Dorset was a crazy front man, lots or running about, leg kicking, a strong raucous voice, and great blues harp. Oh and I so admired those sideburns 🙂 Mungo Jerry (aka Ray Dorset) are still playing to this day, although their UK appearances are few and far between. Another one for my list of bands who I would like to see one more time.